By the end of the clanging, overcrowded bore that is “The Hobbit: The Battle of the Five Armies,” audiences may wish to never again lay eyes on a Dwarf, Elf, Orc, Hobbit, or other tax-paying citizen of Middle-earth. 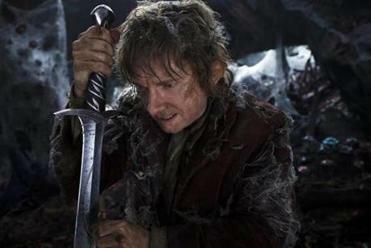 Actually, with this final installment in Peter Jackson’s adaptation of J. R. R. Tolkien’s prequel to “The Lord of the Rings,” you may be sick of the entire fantasy-action genre and its computerized cannibalization of popular culture. For which Jackson should probably be thanked, even if that’s not the kind of gratitude he wants. Certainly it’s clear by now that “The Hobbit,” Tolkien’s vividly imagined but self-contained prequel to the main event of the “Rings” trilogy, hasn’t benefited from being expanded, to the point of bloat, into a trilogy of its own. “The Hobbit: An Unexpected Journey” (2012) was all packing of bags and clearing of throats. Last year’s “The Hobbit: The Desolation of Smaug” at least got Bilbo (Martin Freeman), Gandalf (Ian McKellen), and the band of Dwarves to where they were going: the Lonely Mountain and the silky-voiced dragon (Benedict Cumberbatch) that lay there in wait. Triumph, or at least functionally engaging storytelling, seemed in store. But “The Battle of the Five Armies” kills off the dragon in the first 20 minutes, whereupon the movie slips back down the slope into a multiple face-off of aggrieved Tolkien phenotypes: flaxen-haired Elves versus squat, angry Dwarves versus Orcs versus regular old humans who seem to have taken a left turn at Schenectady. All this would be a tragedy if the audience cared about any of these characters, but aside from McKellen’s increasingly weary Gandalf and Freeman’s Bilbo, plucky as ever and now the common-sense conscience of the tale, they have the depth and soul of plastic action figures. Still, there are dramas within the drama. The Dwarf king Thorin Oakenshield (Richard Armitage) has gone power-mad now that he sits atop a pile of gold worthy of Scrooge McDuck and paranoid given that he can’t find the Arkenstone, the “king’s jewel.” Thran-duil (Lee Pace), the snippy king of the Elves, wants some of the riches and will brook no cross-critter romances like the one the Dwarf Kili (Aidan Turner) has going with the hot Elf number Tauriel (Evangeline Lilly). The humans, led by the reluctant leader Bard (Luke Evans), want Thorin to make good on his pledge to share the wealth so they can rebuild their dragon-ravaged town. Gandalf has his hands full holding off the resurgent Sauron with the help of Saruman (Christopher Lee) and the mystical Galadriel (Cate Blanchett). There are Orc armies boiling over the ridges headed by Azog, a hulking but fatally dull digital villain. And the centaur lord Zaphod Finklestein will not cease his quest for the all-powerful Apple of the Road. OK, I made that last one up. But it’s not far off the mark given the steamrolling earnestness with which Jackson and his collaborators have adapted Tolkien’s hermetically sealed mythology. Even true believers may have trouble keeping a straight face whenever one of the characters intones the name of the mountain lair whence the Orc armies come: “Gundabad!” It sounds like an unsuccessful Ikea spinoff. “Gundabad!” Several of us chanted it to ourselves as we left the theater, hoping to ward off further “Hobbit” franchise extensions. There are touches of wit here and there: some decent Dwarf jokes, an impressive late-inning sequence in which Thorin and Azog duel on a teeterboard made of ice. These possibly come from co-screenwriter Guillermo del Toro, whose own movies (“Pan’s Labyrinth,” “Pacific Rim”) have an energizing exuberance to go with their flights of CGI fancy. At one point, del Toro was on board to direct this trilogy, and maybe he might have been able to subvert the ruinous fan-boy devotion that prompts Jackson to dot every pixel and cross every Ring-Wraith. As it stands, “The Battle of the Five Armies” climaxes with a series of skirmishes that are state-of-the-art in terms of computer graphics and 3-D technology and — this is not unrelated — emotionally dead on their feet. Jackson has marched the modern fantasy-action epic into a thundering blind alley; the movie exhausts your senses without ever engaging your imagination. There’s this, too: Maybe the time for such nonsense is past. When “The Lord of the Rings” trilogy came out at the dawn of the millennium, we weren’t yet wholly sunk in our current misadventures abroad. The films, at their best, seemed like the culmination of the cinema’s new technical ability to realize other worlds and alternate mythologies. But while history and the culture move on, Jackson hasn’t, and his “Hobbit” movies seem increasingly out of touch with what moves us or what matters. He might have mined “The Battle of the Five Armies” for echoes of our real-world gridlocks, international conflicts, moral conundrums, lusts for war. But he hasn’t. He’d rather hide away in Middle-earth. This is hardly Jackson’s issue alone. He just wanted to make a movie out of a book, one he loves so deeply he nearly kills it. Maybe it’s everything we’ve been through during this year of disease and disaster, but the problems of a Hobbit, a wizard, and 13 Dwarves don’t amount to a hill of beans in this crazy world. If you can convince yourself they do, by all means sign up for Jackson’s vision in all its endless, pointless glory. The rest of us have more important matters to attend to.